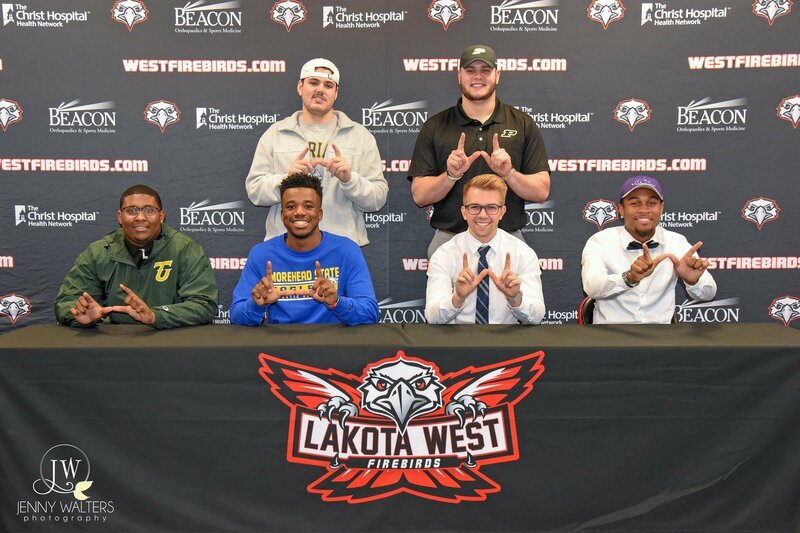 Lakota West Athletic Department hosted an athletic signing event on Wednesday afternoon in the Lakota West community room on the first day of the NCAA Football Regular Signing Period. Five Senior Football players signed their commitment letters to continue their academic and athletic careers at their respective schools. 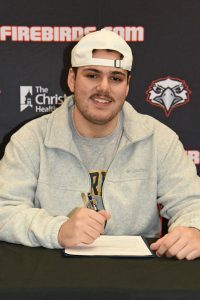 Seniors Dylan Jones and Steven Faucheux signed their commitments during the “early” signing period on December 19th (Link to Story). 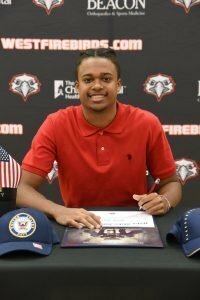 The Firebirds now boast 160 football players in Lakota West history to make the college football commitment since the school opened in 1997. 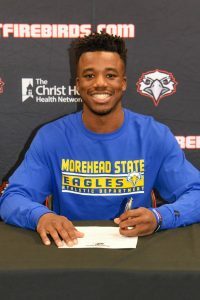 The Firebirds saw eight athletes sign in the fall signing ceremony bringing the total number of signed athletes to 15 for the Class of 2019 (Link to fall story). The next Lakota West signing event will occur on April 17th for all remaining athletes regardless of sport. Our Firebirds at the @BeaconOrtho GMC Signing Event!!! The 6’4” 275lb offensive lineman has been a 3-year varsity starter for the Firebirds. Francisco was named All-District Honorable Mention and 1st team All-GMC his senior season. “Was a Captain for us this year and one of our best players offensively. Great leader for us up front,” said Lakota West Football Coach Jeff Wadl. The 6’1” 260lb defensive linemen has been a 2-year varsity starter for the Firebirds. For his career, he’s recorded 48 total tackles, four sacks, and four forced fumbles. He was named 1st Team All-GMC his senior season. 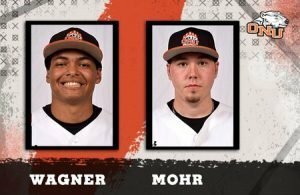 Off the field, Griffin is also known for starting a GoFundMe page to help a teammates medical expenses raising over $36,000. “He’s not only a very good football player but a great human being. 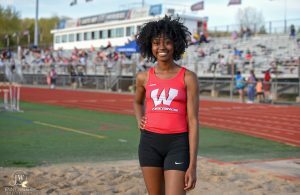 LaDonnis demonstrated a tremendous amount of leadership for us this season,” said Lakota West Football Coach Jeff Wadl. The 5’10” 155lbs kicker has earned his spot as the best punter in Lakota West history. In 2017, he kicked a school record 79 yard punt in the Lakota East game. In 2018, Hjort almost matched the feat with a 77 yard punt against Fairfield. Hjort averaged 36.8 yds/punt his senior season and recorded a GMC leading 14 punts inside the 20. In addition to his punting, Hjort was 9/10 in PAT’s for his career and had a career longest 42 yard FG. Hjort was named 1st team All-GMC in 2017 and 2018. “First Team GMC as a punter, but was also an excellent kicker. 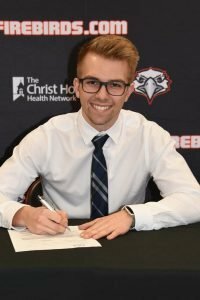 Nick is one of the best athletes on the team as he is also a 300 hurdler for track,” said Lakota West Football Coach Jeff Wadl. The 5’7” 160lbs running back was a 2-year varsity player at Mt. Healthy HS before moving to Lakota West for his senior season. Owensby led the Firebirds in receptions for the 2018 season with 23 for 124 yards. He also rushed for 28 attempts and 83 yards including a 54 yd touchdown run against Oak Hills this season. “Tremendous athlete with a combination of speed and strength. He will be a tremendous asset for Bluffton,” said Lakota West Football Coach Jeff Wadl. The 6’1” 215lb linebacker was a 2-year varsity starter for the Firebirds. Swanson played running back his junior season and moved over to the other side of the ball for his senior season. As a junior, he rushed for 261 yards and three touchdowns. His senior season, Swanson recorded 54 total tackles, one sack and a forced fumble. Swanson was also on the 2018 state qualifying 800 relay for the boys track team. 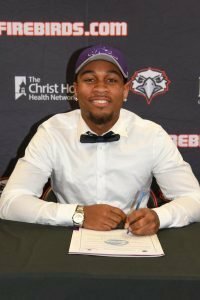 “Jalen was one of the best all-around football players on the team. He played LB this year out of necessity, but was also an effective running back for us his junior year,” said Lakota West Football Coach Jeff Wadl. Steven Faucheux is a three year varsity starter at Lakota West. The 6’5”, 275lb defenseive lineman missed a good part of his senior season due to an injury, but finishes his career at Lakota West with 42 tackles and five sacks. Faucheux has been All-Academic GMC team and was a 2016-17 Under Armour Future 50 selection. Last spring, Faucheux was the conference champion in discuss and was a regional qualifier in the shot put and discus. He was also a member of the 2017-18 Lakota West Varsity basketball team averaging 8 minutes per game. “Steven’s success is a testament to his hard work and passion for the game of football. Despite breaking his leg in week three he was able to battle back and contribute to the team at the end of the season. His leadership was invaluable this year considering the difficult circumstances faced by the program. 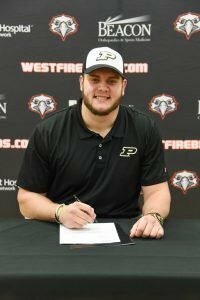 I believe he will be a valuable part of the Purdue Boilermakers football program.” said Lakota West Football Coach Jeff Wadl. Dylan Jones is a two year varsity starter for the Firebirds. The 6’1”, 180lb wide receiver led the team in receiving his junior season and finished his career with 46 receptions and two touchdowns. He set the single game school record for receptions in a game (9) against Hamilton during his junior season. 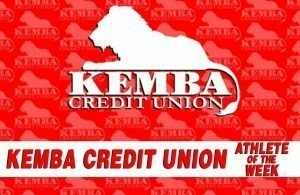 He is also a regional qualifier in the high jump on the track and field team. “Dylan exemplifies all of the qualities the Naval Academy is looking for in their midshipmen. 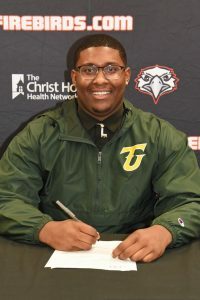 I believe he will make a great student/athlete in college and make the most of this tremendous opportunity.” said Lakota West Football Coach Jeff Wadl. Next Story → Mark Your Calendars: Football Player/Parent Meeting on February 27th!